WonderFil brings you the latest news, events, upcoming thread lines and special tips and advice. Follow WonderFil Specialty Threads on our social media: Facebook, Instagram, Twitter, Pinterest, and Youtube. Kim is the daughter of an accomplished artist, and spent her youth around oil paints and art shows. In high school, she won her first blue ribbon for a sculpture she did. She went on to study art and public relations in college. She had careers designing ceramic jewelry, acting, and in the beauty industry, as well as founding the Rancho Santa Fe Repertory Company, where she produced theatre events, designed sets and costumes, and acted. Designing and making costumes marked her transition into art quilts. Her quilts have appeared in numerous quilt shows, and she has been designing patterns for over 15 years. She opened her own design studio in 2007 in southern California called Starry Night Hollow. She teaches and lectures at her shop and worldwide and she is currently working on her 4th book. She designs fabric and thread (WonderFil's Kim Rado Starry Night Hollow Dazzle collection) and her original patterns are sold in over 8 countries. 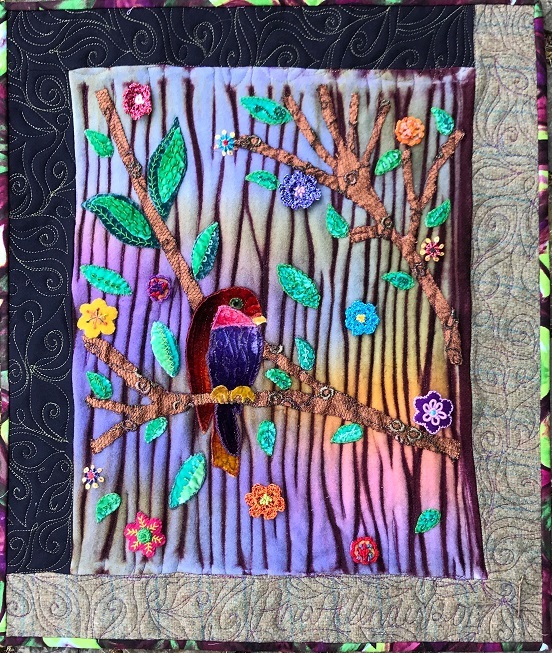 Q: Art quilting is becoming increasingly popular. Do you feel, as a teacher, that people are a little afraid to express themselves artistically? A: Always! My challenge as a teacher is to find ways to make it easier for students to express themselves. I try to help them past the roadblock of not believing they are good enough or talented enough. Q: You have done a lot of pieces that focus on fables and fairy tales. What led you down this path? A: It comes back to finding a way to help people out of their creative 'shell'. I find when I am able to take people back to their youth when they were unafraid to imagine and be artistic, it helps them to feel free to create. I feel that animals have the same effect, which led me to write the 'Feathers and Fur' book. Animals evoke a loving emotion in people, that also helps with creativity. Q: What is your favorite part of teaching? A: I love watching the discovery in student's faces, when they think they have nothing, then realize that they have a lot. I love creating alternative ways for people to create shapes and produce art unconventionally. Q: You helped create a new line of thread for WonderFil. How did that come about? A: That was such fun! About 3 years ago, I was set up in a booth across from WonderFil at the Houston show. I was so drawn to all the beautiful colors in their booth, that I kept going over, and I started to talk to Andrew and invited him to come over and see what I was about. He asked if I would be interested in designing a new line of embellishing threads and I jumped on it. I love the outcome. It is such a beautiful embellishing thread (see below to learn more). Q: Besides the Starry Night Hollow Dazzle, what are your favorite WonderFil Threads? A: That is a tough one! I love the DecoBob for appliqué, and the wool thread, Ellana. I often use Tutti for my quilting, and Eleganza for embellishing. And I have just discovered the new Glamore, which is fantastic. Q: What are some of the classes coming up at your studio? A: I am in the middle of writing another book, called 'Fairytales'. I will be teaching the different projects in my studio classes, and their finished work will end up in my book. Quilt embellished with WonderFil's Kim Rado Starry Night Hollow Dazzle. One of the new threadlines WonderFil released at the Houston show this past fall was the Starry Night Hollow Dazzle. It is an 8 wt rayon, with 3 strands of different colored rayon twisted with a strand of metallic. The result is a beautifully dimensional and sparkly thread that is perfect for hand embellishing, couching or for use in your serger loopers. What a great new twist to the WonderFil Dazzle line!